The huge, private garden extends to almost an acre and has swings for the children. Comfortably furnished for 8 guests in 3 bedrooms (cot available). Offering two bathroom/Shower rooms it is the perfect Cottage for two couples or extended families to share. 2 safe sandy beaches nearby. Full & unlimited central heating. Family bedroom with four poster bed, bunk beds and cot. Downstairs king size bedroom with en suite shower room. Ideal for two couples or extended families sharing due the 2 shower/bathrooms. Up to 3 dogs allowed at no extra charge. You can Walk to the World famous Coastal Path at beautiful Ceibwr Bay with it's stunning rock formations and spot rare and unusual sea mammals from the cliffs. 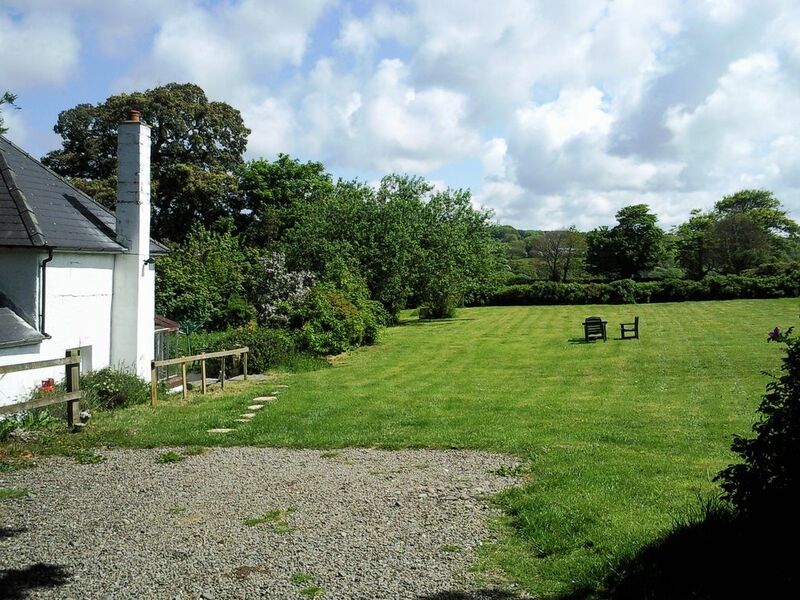 Located between the bustling Market Town of Cardigan and Newport village Offering comfortable accommodation for 8 guests+ cot, the Hafod Villa has a sunny conservatory, cosy sitting room with log burner and Sky+ Sports & Films and Wifi. A spacious kitchen / dining room, downstairs king size bedroom with ensuite. Upstairs is a family bathroom, a Family (with four poster) bedroom and a twin bedroom with pretty garden views. Outside there is private parking for up to 3 cars and swings for children in the huge private garden. toilet, shower, The En suite shower room provides privacy for 2 couples. Family bathroom with washhand basin, lavatory, 5'6" bath with overhead shower which is restricted in height if you are very tall! Halogen hob & electric freestanding cooker with grill, integrated fan cooker with grill. The bright and spacious kitchen which very well equipped for 8 people it is open plan with the dining room which has a table seating 8 guests. 3 miles Newport golf course, 8 miles Cardigan golf course. Notes on accommodation Up to 3 dogs with well-behaved owners welcome. Outside: The huge garden is the ideal area for children (and adults) to play ball games or use the swings. Utility Room: Small utility with iron, ironing board, freezer and washing machine. There is a rotary dryer in the garden. Cleaning / Towels / Linen / Maid service: Bedlinen is included and towels are an optional extra. Other: The conservatory is large and sunny with a conservatory suite with coffee table and small dining table with two chairs. Ideal for dumping wellies, dogs and buckets and spades! We are very pleased that you had a really good holiday at Hafod Villa, you certainly seem to have made the most of your stay. Thank you for this lovely review which I am sure future guests will find very useful. Ann also says thank you for leaving the Cottage nice and tidy as it does make it easier for her. Hopefully we shall see you all again at Hafod Villa at a future date. The garden was fantastic for children and dogs but the house needs updating. It was comfortable for the 3 of us but the showers were lacking in water pressure and keeping constant heat. This was annoying but it would be more so if more people were staying. It would also have been helpful to have a long handled brush available to sweep the conservatory particularly with dogs going in and out. The living room was comfortable. The kitchen was nice & large but the utensils had to be cleaned by us before using as they had been left dirty and greasy. The heating was very good but we couldn't find a way of turning down/off the radiator in the main bathroom and it was exceptionally hot. We did enjoy the stay, despite what I have put above, but the updating etc would help. Thank you for this review which I am sure visitors will find useful. I am pleased that you enjoyed your stay and hopefully we shall see you again. Sadly the cost of updating the cottage would be prohibitively expensive at this time. Prior to your visit, the carpets were professionally cleaned, flooring in the conservatory was replaced and all rooms were repainted. We do advertise as being a comfortable 3 star property. We added the en suite downstairs this winter (which has wiped any profit for this year) and whilst not aware of low water pressure I presume that as it's only a cottage, two people cannot shower at once. I shall ask the plumber to look into this however so thank you for letting me know. A broom and vacuum cleaner is normally left in the conservatory. I have asked Ann the Housekeeper to address the problem of dirty cutlery which has not been reported before. This was our second visit to Hafod Villa and unbelievably the weather was as fantastic this year as last so once again we were able to take advantage of the huge garden, our 3 dogs racing around to their hearts content. As the cottage is very remote it is lovely to sit outside with a cold drink and it be so peaceful, it is the perfect place to unwind. The walk through the woods to the bay is gorgeous and a short drive takes you to either Newport Beach or Poppit Sands, both dog friendly. The cottage itself is well equipped, cosy living room and large kitchen/diner. The utility room has a freezer which is a bonus when having your weeks shopping delivered by Tesco! Communication when booking is very good, Josy the owner being very friendly and helpful. I'm sure we will be back for a third visit! Thank you for this great review and I am so pleased that you had another happy holiday at Hafod Villa. it's lovely to read about what you enjoy doing the most as I immediately visualise your dogs racing around the garden and on the beaches, as well as you relaxing with that cold drink in the evening! Ann says thank you for leaving the cottage tidy as it makes her work so much easier. We will both be delighted to see you all once again. I am so pleased that you and your family had such a good holiday. Thank you for the information too which I am sure will help other visitors. Ann said thank you for leaving Hafod Villa nice and tidy and we both hope to see you all at a later date. Ideal for Twitchers & those interested in observing unusual sea mammals. There are petting farms and theme parks and numerous interesting days out. Horse-riding, clay pigeon shooting, hiking, coasteering, kayaking, archery, canoeing, sea fishing, trout and salmon fishing, bird spotting, nature trails and many arts and craft workshops. Ceibwr Bay just over a mile and a lovely walk. The caves are frequently a nursery for seal pups in autumn. From the cliffs are frequent sightings of seal, dolphins, porpoises, basking sharks and even turtles and wales at times. Newport Traeth is a wide sandy beach you can drive onto with caves and rockpools to explore. Poppit Sands beautiful sandy beach with dunes and rocks. Nearest Ferry port is Fishguard (to Rosslare) approx 18 miles. Nearest Train Station is Fishguard (there is a daily train from London) or to Aberystwyth (more frequent) an hour by coach. There is the Poppit Rocket bus in the summer months which stops in Moylegrove and there several cab firms based in Cardigan and Fishguard. A Car is advised by with big groups guests frequently have arrived via train begging a lift from those with a car from either Cardigan or Fishguard. Moylegrove is a very picturesque coastal village. 3 miles to Nevery which has a good pub the Nevern Arms and the Church has a bleeding yew and Celtic Cross. Newport 5mls has excellent restaurants bars, gallery and theatre. St Dogmaels some lovely pub and abbey. Cardigan 5 mls is a bustling market town with shops bars and restaurants, theatre boat trips castel etc. Kilgerran with it's stunning gorge, castle, wildlife park and restaurants. St Davids City 50min drive and a good day out. ATM's at Newport and Cardigan. Tesco home delivery as well as an excellent local bakery. I provide an extensive information sheet once people have booked. Notes on prices: Please ensure that you have holiday insurance. All prices include: up to 3 well behaved dogs. Linen (towels optional extra), unlimited central heating (£15 supplement in winter) Sky+ Sports and Films and Wifi.